I’m falling asleep at the wheel. I’ve been driving for 16 hours straight, hauling freight across the border between Nevada and California. Yawning, my eyes briefly flutter shut and I lose sight of the road. My eyes flick open and I straighten up my lorry. I should pull over at a motel and sleep but then I’ll be late delivering the petrol I’m delivering to a garage in Fresno. I can’t be late: my bank account is overdrawn after buying a new truck for my garage in Las Vegas. If I don’t get all the cash for this job I won’t be able to meet my next loan repayment. Clearly, I’ve become a little too invested in American Truck Simulator. There’s been a long tradition of mocking a particular brand of simulator games. Flight sims were safe, everyone could understand why you might want to try and learn how to fly an F16 or land a Boeing 747. The same for games like Kerbal Space Program, which offers up an approximation of running your own space-faring firm. The ribbing was reserved for games like City Bus Simulator, Garbage Truck Simulator, and Warehouse and Logistics Simulator. Games that simulate jobs few people aspire to. The Truck Simulator series was amongst those mocked games. Yet, in spite of how it was perceived, over the past few years it has had a growing, loyal following. The jokes about European Truck Simulator have given way to people talking about how earnestly they enjoy hauling freight in long, uneventful journeys up and down Europe’s motorways. 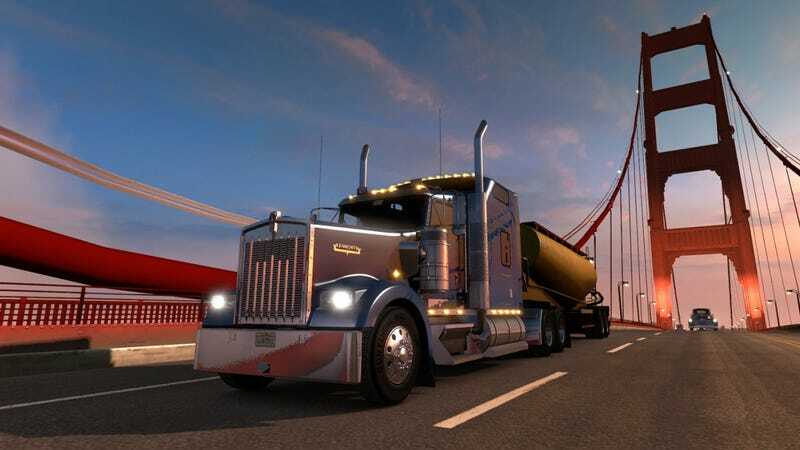 American Truck Simulator is the first time I’ve played any of the games in the series and what surprised me most wasn’t that I enjoyed myself. It was how quickly I became engrossed by it. I’ve not played anything else since installing it last Friday. You start off without a truck of your own. After a brief rundown of the controls you gain access to a list of jobs for other truck companies who will lend you a vehicle in return for a significant cut of your earnings. In those early jobs you’ll begin to discover the different towns spread across California and Nevada. Occasionally you’ll come across truck dealerships, garages for sale, and recruitment agencies. Hints of what you’re saving up your earnings for. The end goal of American Truck Simulator is starting up your own business: buying garages and a fleet of trucks and hiring the drivers to take jobs across the country. Essentially, you will become like the companies who let you use their trucks at the start of the game. Still with trucks costing more than $100,000 and property costing even more, it’s going to be a long road to get there when you’re only earning $2,000 a job. On the surface it may sound monotonous—and, at times, it is—but the systems underlying the game lead to compelling drives. One time, after I’d bought my own truck, I took my eye off the road and crashed my truck into a car in front. As well as a hefty fine, I seriously damaged my engine. It would now intermittently cut out, needing a restart. I couldn’t afford the repairs right away so I took on another job. It was a long haul, taking construction equipment across the state overnight. In the game I began to doze, each time I’d wake up and have to swerve my truck out of the way of oncoming traffic, or repoint it onto the road. I was about to take an exit up on off ramp when I, again, nodded off. I woke up just in time to slam on the brakes and hold back from rear ending a police car at the top of the ramp but as I came to a halt my damaged engine switched off. My truck and its long, valuable load began to roll back onto the highway behind me; a highway with cars speeding down to road at 80km/h. I frantically tried to restart the engine and fight to start my truck back up the steep hill before causing an accident. Thankfully the engine kicked into life and slowed my reverse just in time to stop me from taking out a bus (that I picture was filled with nuns and orphans who had been out for a day trip). I was the hero of my own mini trucking adventure. I don’t know how much longer American Truck Simulator will hold my attention, I don’t know if there is much to do now that I’m on the cusp of owning a self-sustaining fleet, but I’ve had so many moments like that accident fraught night drive emerge organically from the game’s systems that I’m going to keep playing for a good while yet.